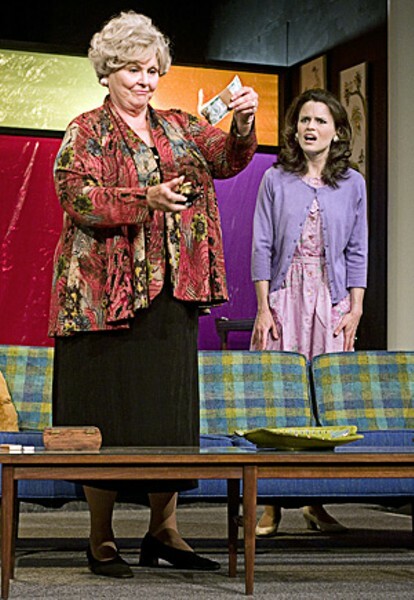 John Lamb Garden, variety: Donna Weinsting and Julie Layton in Stray Dog's Everything in the Garden. Through June 20 at the Tower Grove Abbey, 2336 Tennessee Avenue. Tickets are $20 ($18 for students and seniors). Call 314-865-1995 or visit www.straydogtheatre.com. "There is no rest for the wicked in the suburbs." In Edward Albee's rarely staged Everything in the Garden, that quip is tossed off as a genial bon mot, but its underlying truth serves as the cornerstone of Albee's corrosive indictment of life among the affluent and those who would strive for affluence. "You're all killers and whores," our heroine Jenny decries about those who would pass judgment on her dubious personal morals. Though she's speaking metaphorically, by evening's end Jenny turns out to be more accurate — even more prophetic — than she could have imagined. Everything in the Garden has a curious history. It is based on a 1962 absurdist comedy by Giles Cooper, a successful British writer who died four years later after a train fall. To my knowledge, Cooper's play was never produced in the United States. Albee's adaptation, which relocates the play to America and is much more realistic than the original, debuted on Broadway in 1967. Audiences were unsettled by such an unrelenting attack on those values (the pursuit of a dishonest buck) that so many hold dear. Garden soon vanished from the Albee canon. Leave it to Stray Dog Theatre, with its commitment to lesser-known works, to unearth this provocative script. Four decades after its initial failure, it is now clear that, although the play is still a bitter pill to swallow, Albee's ballad of Jenny is very well written indeed. The audacious Everything in the Garden predates Ira Levin's popular novel The Stepford Wives by five years. But whereas Levin uses suburbia as a convenient locale for easy chills, Albee's horror story rages at the excessive corruption he felt had permeated America. Yet although Stray Dog is to be commended for restoring this dark play to light, the production is perplexing. So many unanswered questions. Why, for instance, in a story whose impact relies on its realistic staging, do the walls of Jenny and Richard's suburban home resemble a circus fun house? In what manner is this story being told? The Stray Dog press release likens Garden to Desperate Housewives ("You'll laugh until your sides ache..."). If that kind of hype helps to elicit a wider audience, fine. But it is wrong to stage the play in the mode of a television sitcom. Gary F. Bell's direction shortchanges the script's savage power and instead reaches for laughs that (on opening night) did not come. This misguided approach is personified in Charlie Barron's over-the-top performance as Richard, the dead-end husband ("43 years old and I haven't even got a power mower") who discovers to his dismay that his wife is now the family's principal breadwinner — and all this bread stems from a part-time job. It's hard to imagine that an actor as intelligent as Barron would have come up with such an off-compass portrayal on his own. Don't misunderstand: There should be laughter throughout Everything in the Garden. But as with most satire, the viewer should be laughing in response to incredulous situations — and laughing to keep from gasping. Not laughing because an actor smacks you in the face with dialogue. What we're left with (apart from Donna Weinsting, appropriately imperturbable as a bordello madam with money to burn) is the straight-on sincerity of Julie Layton's Jenny. There is actually a Stepford quality about Layton's ability to wend her will with rolling puppy-dog eyes, raised eyebrows and a trembling lower lip. But she also brings a welcome sense of reality to a staging that places little stock in reality. What she's unable to do is to convince us that Jenny loves Richard. Everything in the Garden may be a cynically outrageous love story, but it is a love story nevertheless. If Jenny's unconventional choice of a part-time job is not rooted in her love for Richard, then she is no more than a callous mercenary. 'Tis pity she's a whore. But in a more fully realized staging, Albee's dark ambitions would be seen as running much deeper than mere pity. Click here for a complete list of St. Louis stage capsules.